Mimas, also designated Saturn I, is a moon of Saturn which was discovered in 1789 by William Herschel. It is named after Mimas, a son of Gaia in Greek mythology. With a diameter of 396 kilometres (246 mi) it is the smallest astronomical body that is known to still be rounded in shape because of self-gravitation. However, Mimas is not actually in hydrostatic equilibrium for its current rotation. Mimas was discovered by the astronomer William Herschel on 17 September 1789. He recorded his discovery as follows: "The great light of my forty-foot [12 m] telescope was so useful that on the 17th of September, 1789, I remarked the seventh satellite, then situated at its greatest western elongation." 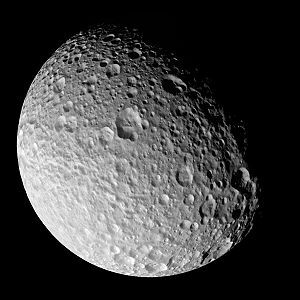 Mimas is named after one of the Giants in Greek mythology, Mimas. The names of all seven then-known satellites of Saturn, including Mimas, were suggested by William Herschel's son John in his 1847 publication Results of Astronomical Observations made at the Cape of Good Hope. He named them after Titans specifically because Saturn (the Roman equivalent of Cronus in Greek mythology), was the leader of the Titans and ruler of the world for some time. Mimas was a son of the Greek goddess Gaia. Cassini view of Mimas's trailing hemisphere, showing craters up to 6 km deep and 1-km-deep chasmata (grooves). The large crater near center is Morgan; Arthur is close to the lower right limb. Pelion Chasma is faintly visible as a horizontal trough left of Arthur and below Morgan. The surface area of Mimas is slightly less than the land area of Spain. The low density of Mimas, 1.15 g/cm3, indicates that it is composed mostly of water ice with only a small amount of rock. Due to the tidal forces acting on it, Mimas is noticeably prolate; its longest axis is about 10% longer than the shortest. The ellipsoidal shape of Mimas is especially noticeable in some recent images from the Cassini probe. Mimas's most distinctive feature is a giant impact crater 130 km (81 mi) across, named Herschel after the discoverer of Mimas. 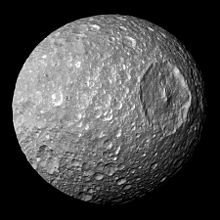 Herschel's diameter is almost a third of Mimas's own diameter; its walls are approximately 5 km (3 mi) high, parts of its floor measure 10 km (6 mi) deep, and its central peak rises 6 km (4 mi) above the crater floor. If there were a crater of an equivalent scale on Earth (in relative size) it would be over 4,000 km (2,500 mi) in diameter, wider than Australia. The impact that made this crater must have nearly shattered Mimas: fractures can be seen on the opposite side of Mimas that may have been created by shock waves from the impact travelling through Mimas's core. The Mimantean surface is saturated with smaller impact craters, but no others are anywhere near the size of Herschel. Although Mimas is heavily cratered, the cratering is not uniform. Most of the surface is covered with craters larger than 40 km (25 mi) in diameter, but in the south polar region, there are generally no craters larger than 20 km (12 mi) in diameter. Three types of geological features are officially recognized on Mimas: craters, chasmata (chasms) and catenae (crater chains). A number of features in Saturn's rings are related to resonances with Mimas. Mimas is responsible for clearing the material from the Cassini Division, the gap between Saturn's two widest rings, the A Ring and B Ring. Particles in the Huygens Gap at the inner edge of the Cassini division are in a 2:1 orbital resonance with Mimas. They orbit twice for each orbit of Mimas. The repeated pulls by Mimas on the Cassini division particles, always in the same direction in space, force them into new orbits outside the gap. The boundary between the C and B rings is in a 3:1 resonance with Mimas. Recently, the G Ring was found to be in a 7:6 co-rotation eccentricity resonance[clarification needed] with Mimas; the ring's inner edge is about 15,000 km (9,300 mi) inside Mimas's orbit. 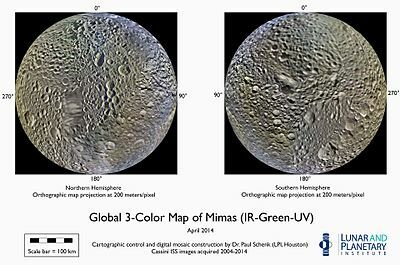 In 2014, researchers noted that the librational motion of Mimas has a component that cannot be explained by its orbit alone, and concluded that it was due to either an interior that is not in hydrostatic equilibrium (an elongated core) or an internal ocean. However, in 2017 it was concluded that an ocean would lead to surface tidal stresses comparable to or greater than those on tectonically active Europa. Thus, the lack of evidence for surface cracking or other tectonic activity on Mimas argues against the presence of such an ocean. Since formation of a core would likely have led to formation of an internal ocean in the past, probably leading to geologic activity, this explanation for the libration is also problematic. The presence of an asymmetric mass anomaly associated with the crater Herschel is another possible explanation for the libration. Pioneer 11 flew by Saturn in 1979, and its closest approach to Mimas was 104,263 km on September 1, 1979. Voyager 1 flew by in 1980, and Voyager 2 in 1981. Mimas was imaged several times by the Cassini orbiter, which entered into orbit around Saturn in 2004. A close flyby occurred on February 13, 2010, when Cassini passed by Mimas at 9,500 km (5,900 mi). When seen from certain angles, Mimas resembles the Death Star, a fictional space station and superweapon known from the 1977 film Star Wars. Herschel resembles the concave disc of the Death Star's "superlaser". This is coincidental, as the film was made nearly three years before Mimas was resolved well enough to see the crater. 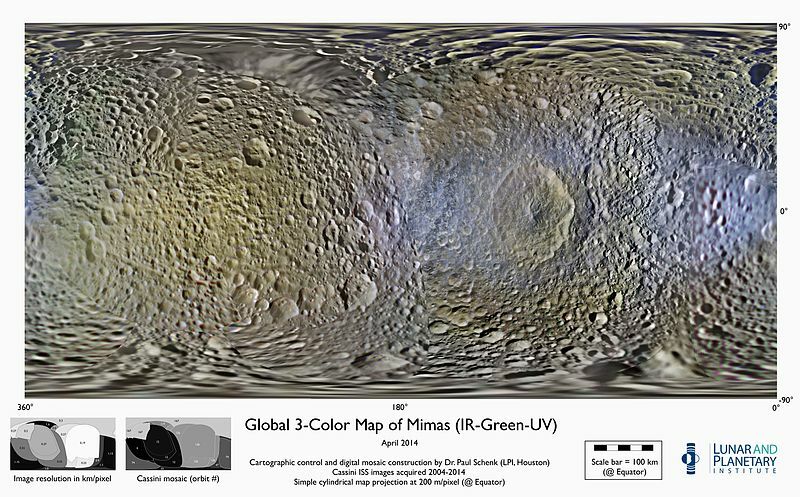 In 2010, NASA revealed a temperature map of Mimas, using images obtained by Cassini. The warmest regions, which are along one edge of Mimas, create a shape similar to the video game character Pac-Man, with Herschel Crater assuming the role of an "edible dot" or "power pellet" known from Pac-Man gameplay. ^ "Imago Mundi: La Découverte des satellites de Saturne" (in French). ^ Harvey, Samantha (April 11, 2007). "NASA: Solar System Exploration: Planets: Saturn: Moons: Mimas: Facts & Figures". NASA. Retrieved 2007-10-10. ^ Jacobson, R. A.; Spitale, J.; et al. (2005). "The GM values of Mimas and Tethys and the libration of Methone" (PDF). Astronomical Journal. 132 (2): 711–713. Bibcode:2006AJ....132..711J. doi:10.1086/505209. ^ Herschel, W. (1790). "Account of the Discovery of a Sixth and Seventh Satellite of the Planet Saturn; With Remarks on the Construction of Its Ring, Its Atmosphere, Its Rotation on an Axis, and Its Spheroidical Figure". Philosophical Transactions of the Royal Society of London. 80 (0): 1–20. doi:10.1098/rstl.1790.0001. ^ Herschel, William Philosophical Transactions of the Royal Society of London, Vol. 80, reported by Arago, M. (1871). "Herschel". Annual Report of the Board of Regents of the Smithsonian Institution: 198–223. Archived from the original on 2016-01-13. Retrieved 2006-11-26. ^ Lassell, William (1848). 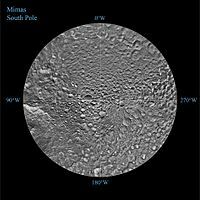 "Satellites of Saturn: Observations of Mimas, the closest and most interior Satellite of Saturn". Monthly Notices of the Royal Astronomical Society. 8: 42–43. Bibcode:1848MNRAS...8...42L. doi:10.1093/mnras/8.3.42. Retrieved 2006-11-26. ^ Elkins-Tanton, Linda E. (2006). Jupiter and Saturn. Infobase Publishing. p. 144. ISBN 9781438107257. ^ Tajeddine, R.; Rambaux, N.; Lainey, V.; Charnoz, S.; Richard, A.; Rivoldini, A.; Noyelles, B. (2014-10-17). "Constraints on Mimas' interior from Cassini ISS libration measurements". Science. 346 (6207): 322–324. Bibcode:2014Sci...346..322T. doi:10.1126/science.1255299. ^ a b Rhoden, A. R.; Henning, W.; Hurford, T. A.; Patthoff, D. A.; Tajeddine, R. (2017-02-24). "The implications of tides on the Mimas ocean hypothesis". Journal of Geophysical Research: Planets. Bibcode:2017JGRE..122..400R. doi:10.1002/2016JE005097. 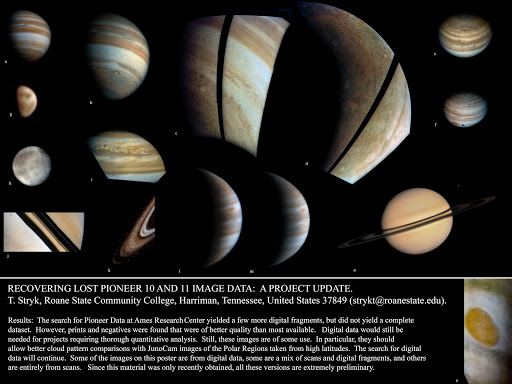 ^ "Pioneer 11 Full Mission Timeline". Dmuller.net. Retrieved 2012-02-26. ^ Young, Kelly (2005-02-11). "Saturn's moon is Death Star's twin". New Scientist. Retrieved 2008-08-21. Saturn's diminutive moon, Mimas, poses as the Death Star – the planet-destroying space station from the movie Star Wars – in an image recently captured by NASA's Cassini spacecraft. ^ Cook, Jia-Rui C. (2010-03-29). "1980s Video Icon Glows on Saturn Moon". NASA. Retrieved 2010-04-02. ^ "Bizarre Temperatures on Mimas". NASA. 2010-03-29. Retrieved 2010-04-02. ^ "Saturn moon looks like Pac-Man in image taken by Nasa spacecraft". The Daily Telegraph. 2010-03-30. Retrieved 2010-04-02. Wikimedia Commons has media related to Mimas (moon).